Other than a slight uptick in volume for the S&P, it was a relatively quiet day. The one index which hinted at a change was the semiconductor index. 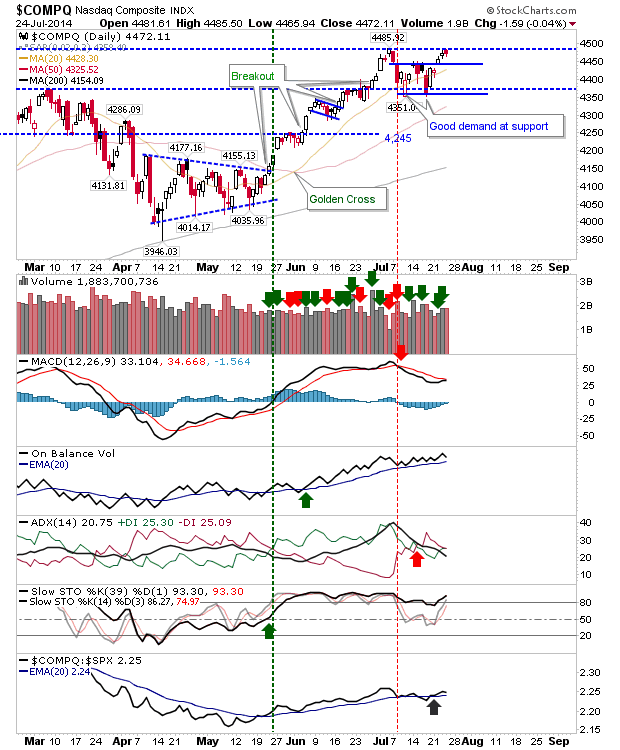 It had been trading in a sideways range which had drifted outside of its narrow, rising channel, but yesterday's close positioned it as a break of support. The 50-day MA is nearby to provide support, but with technical weakness expanding there is a strong possibility for a larger move down. Should Semiconductor weakness expand, it will offer a shorting opportunity in the extended Nasdaq 100. The Nasdaq 100 has so far defended the 20-day MA, but it's looking vulnerable to a March-style retreat and is very extended relative to the Russell 2000; watch for rotation out of Nasdaq 100 components. The bounce in the underperforming Russell 2000 is looking a little tired, with yesterday's bearish 'engulfing pattern' indicating a test of the 1,131 swing low is currently in play. 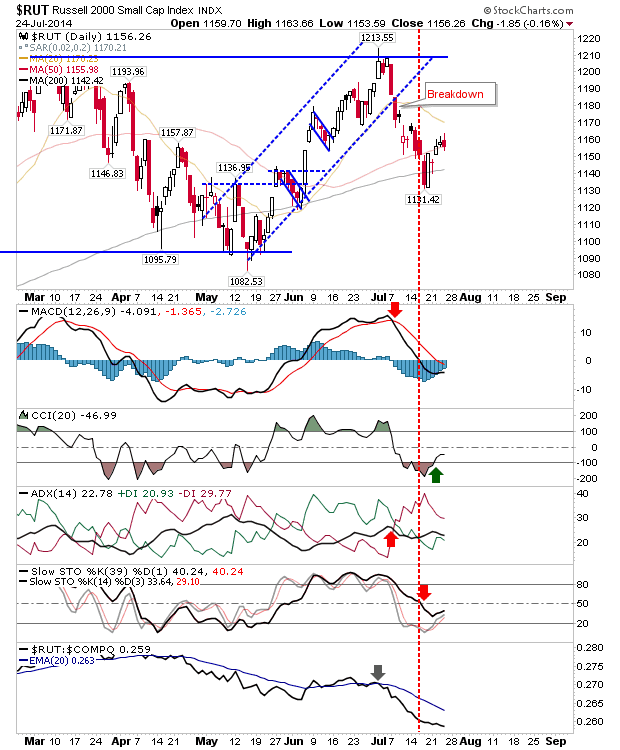 The index could again find support at the 200-day MA (1,142), and is likely to shape a bullish divergence as value players look to take advantage of the sharp, relative underperformance of this index. While the Semiconductor index is weak, the Nasdaq is looking more likely to breakout higher than reverse lower. 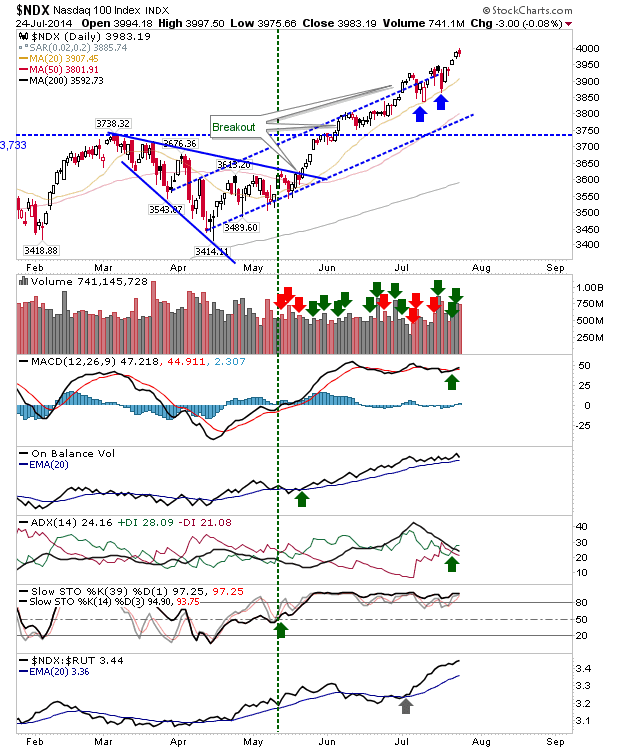 Should Semiconductor index weakness continue, and the Nasdaq breakout, then there is a high risk of a 'bull trap' breakout failure in the Nasdaq, but with the Nasdaq's MACD looking ready to signal a 'buy' and other supporting technicals in good health, the trade position looks more favourable as a long. The S&P is the dullest of the indices. 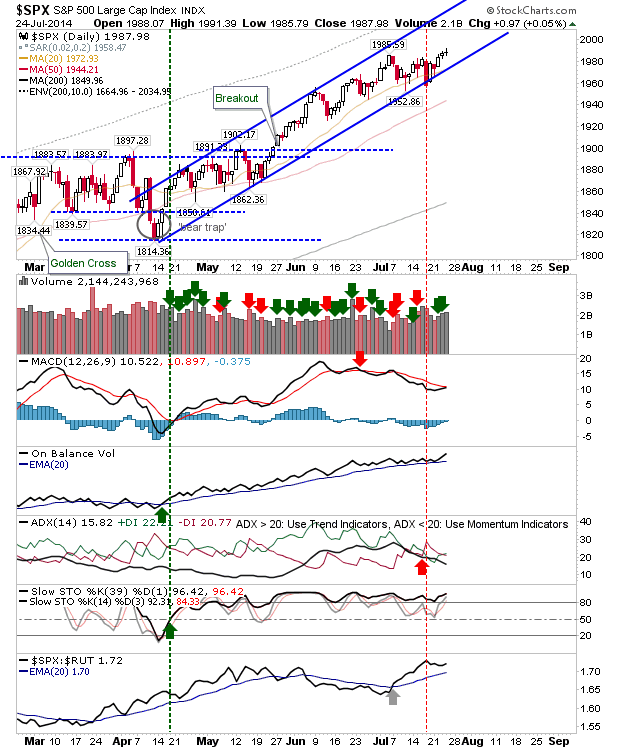 It too looks ready for a MACD 'buy' as it continues its ascent inside the rising channel. No reason to be selling here yet, and long positions remain favoured. 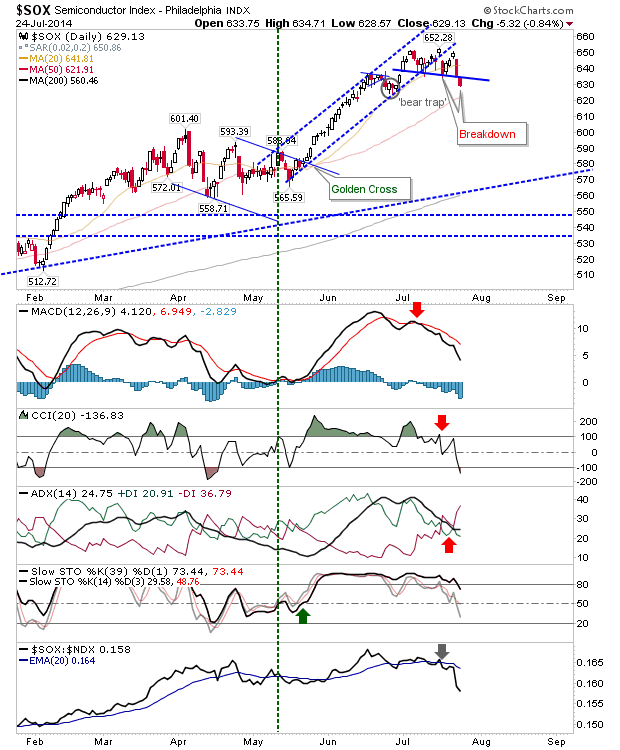 So, keep an eye on Semiconductor weakness with the potential for a short play - at least until stochastics [39,1] are oversold. More aggressive players may try to make a short trade work in the Nasdaq 100, although this is going against a powerful bull trend. Longs can watch for a break in the Nasdaq, with short covering likely to be the first driver for higher prices.